The Hall of Mirrors, as drawn by my kids! Warning: Spoilers for aspects of Thunderspire Labyrinth below! I spent the last three blog posts discussing Breaking Patterns in 4E. In the first blog I talked about starting with story and letting that drive the encounter design. In the second installment I provided an example of how I work from a bare set of ideas and adapt adventures to PC choices and flesh out my ideas as the PCs respond. In the third installment I shared how I handle travel and an abstract mini-less combat in 4E. I really appreciate the feedback I received. It kills me not to be able to blog more often, but since that time I have been hard at work with my other fellow Ashes of Athas admins on Chapter 2 of the organized play campaign. I can’t begin to describe how much work it is, even with talented admins and authors. In just a few hours players will begin to play these new adventures! In other news, I will have adventures this year in Dragon and in Dungeon. It isn’t possible to capture in words how pleased I am about this. I am honored. As with crafting adventures, it is interesting how hard you can work and yet at the end realize you can’t achieve perfection. The good news is that, just as with home campaign design, you don’t need perfection to add value. With that, let’s return to the subject at hand. Specifically, I want to talk about my method for hacking existing adventures for use in Dark Sun. Session 10: The PCs are relieved to learn the halflings won’t eat them. Instead, they are told about a strange temple that draws halflings to it. Any who enter never return. The PCs deduce that this must be the same temple they seek – the one that holds the second part to the Crown of Sorrow, a lost artifact of Yaramuke and a central component to the campaign (and the fate of their home village). 1) I want a strong psionic feel for this encounter, reflecting the nature of the artifact within. I go through a number of story ideas, but I find myself sidetracked by my usual tendency to borrow from Indiana Jones. I go with my gut, quickly developing an ending: If the PCs emerge victorious they will find themselves surrounded by hired foes, with their hated rival demanding that they hand over what they have found. Right out of Raiders of the Lost Ark, and should work well for this group. I further decide to have some psionic feel throughout the session, and to have some confusion over what is real or imagined. Finally, I decide that at the end they will realize the entire battle took place in their minds. This shows the power of the artifact and carries the theme. 2) I now need to get some details down for what is in the temple. I start with just a ruined room that seems to be all there is. Then I add a bricked-up archway that the some see as an open misty passageway. This captures the mind effect. They all try to see the passageway and succeed, opening their minds. I had been looking over published adventures for some other reason. I don’t use pre-published adventures that often, though I love reading them for ideas. Rich Baker and Mike Mearls do a really good job with Thunderspire Labyrinth and in thumbing through it I found myself really liking three encounters. I whittled that down to two, as with RP I would not be able to handle more than that. The first is the Hall of Enforced Introspection. I lifted the key concept, that the room has several pillars with mirrors. As PCs move closer to them they will see something reflected, triggering an effect. I customized the pillars by adding a vision each PC would have if “trapped”. The visions were tied to their backstory and often requiring them to confront some aspect of their past (or even future). Instead of fighting a monster, they needed to confront the scene and perhaps make a skill check. I let them out when I was satisfied that the confrontation had been successful, with some adjustment for dice. The foes are undead, but I wanted something elemental, themed to Earth. I used a Dust Devil (described as wind-blown shards of rock and dirt) and Tarek Raiders and a Tarek Shaman (described as beings of earth and stone). I know these creatures well from Encounters and Dark Sun Arenas, so I had a good feel for how they would perform. To tie them to the psionic concept I gave the Dust Devil the Blind the Mind’s Eye power. I gave the Raiders the Psionic Augmentation to deal ongoing psychic on top of a regular attack. Both powers are part of the monster themes in the DSCC. I role-played the effects so the concept would carry. The combat played well. The mix of the interesting pillars, the way some PCs were teleported around (disrupting normal tactics) and the strong opponents all added up to a lot of fun. 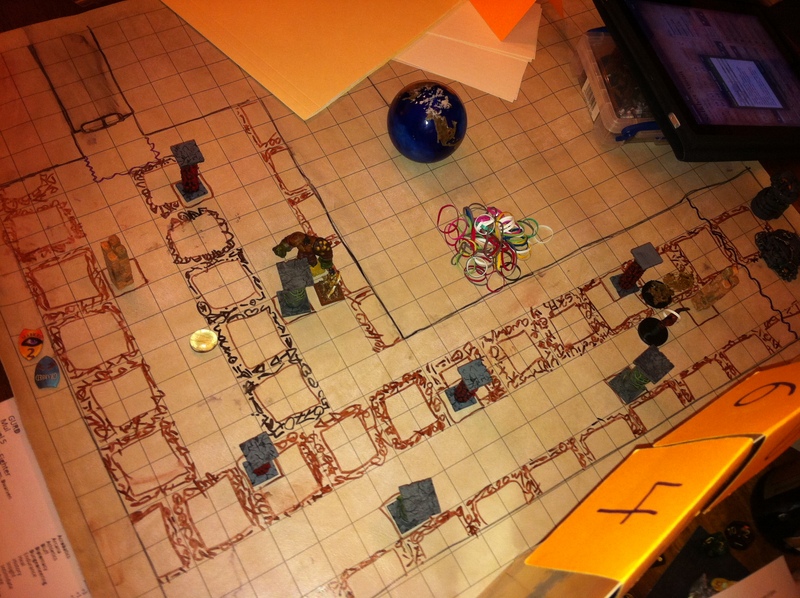 Oh, and my kids decorated the floor tiles on the battlemap, which added some nice decor and a bit of worry for the PCs as they wondered if stepping on the decorations would have any effect! In the end PCs found the room held a metal sword broken into several pieces. The moment they picked up all the pieces the room before them faded and they were somewhere else. 3) I wanted the next encounter to be a huge challenge. This artifact is shielded, but it still has to be protected by something fierce. My story was that the artifact’s protector is growing ancient. As the ages pass he becomes the temple, creating one last challenge. The Proving Grounds encounter in Thunderspire was perfect for this, and not just because it also has something inspired by Raiders! I began the encounter by allowing them to slowly explore the map (a poster map is provided with the adventure). I had covered the map and slowly revealed it so as to create suspense… but they found no threats. They noticed all sorts of possible threats, but nothing attacked. There was a huge pit, a strange scraped area around the central area, many altars, some etched symbols, skeletons in metal chains, blood, and finally a door beyond the skeletons that could not be opened. In the door were the rough shapes of the four parts of the sword. Because it was rough, the sword pieces could not actually fit. The Temple of the Mind’s Eye! The blue circles are the etched runes. When the four pieces were placed, the fun started. I wanted a strong Alien (the movie) feel. The lights immediately became dim and the corridors and rooms filled with concealing smoke. The pieces of the sword disappeared and could be heard clattering to the ground somewhere… sound was clearly distorted now! The PC in front of the door could see that the four impressions were distinct… all they had to do was bring the pieces to the door and it would likely open! And then? And then they heard a horrible hissing sound and the scrape of claws upon stone from some horrid creature. The additional sound of something massively large moving and grinding stone added to the frightening situation. Initiative was rolled. I used the traps from the encounter, but lowered the level and made their effects obvious. The doom sphere was something I tracked myself, not placing it on the map if it could not be seen. And then there was the monster. Monster needs to be accurate but with low damage. It can’t devastate PCs in one blow. 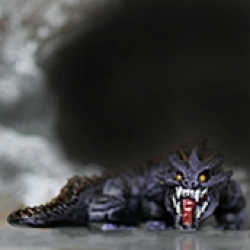 Flipping through the Dark Sun Creature Catalog I came upon the Id Fiend (level 1 solo controller). It made an appearance in Dark Sun Arenas and was brutal. What would it be like at level 5? And how could it achieve my goals? The first thing I did was use the classic Monster Builder to make the level 1 version of the monster. I always make the normal version first if the MB doesn’t have it, should I need it in the future. Then I advanced it to 5th level. If you aren’t familiar with leveling creatures, Chris Perkins summarized the easy way to do it here. MB does it automagically, but checking the math is recommended. Sly Flourish has had some good coverage, including this article on Calculating Monster Damage. To make it a lurker and mobile I gave it two key capabilities. First, a trait: At the start of combat, the id fiend makes two initiative checks. On the second initiative count the id fiend may only take 2 move and 1 minor action. This allows the creature to act often, but not to be overly deadly. It can take two move actions on the second turn, letting it escape grabs and still move away, move a lot, and even use the minor for the Fearful Torment power (which immobilizes). The second bit was a get-away power, an altered version of a theme power: Psionic Flight. Move action. Recharge 5 6. Effect: The id fiend pushes each enemy adjacent to it 1 square and then flies its speed. If it has concealment, the id fiend may make a stealth check to hide. This is what will let it hide often, since the rooms are filled with concealing smoke. With just those two changes my solo controller is a solo-controller-lurker and can strike and get away to go strike again. These powers work perfectly with Quick Slash and Snapping Jaws, which allow the creature to move about while attacking. I can do both through the Double Attack. The triggered Whipping Tail further protects me and sets up more movement possibilities. The ability to use my minor on two initiative counts helps make Manifest Fear even stronger and further lets me lurk. This is a terror! It should be a fun terror because it isn’t ridiculously damaging and will be moving from PC to PC. I’m not done, of course. I give myself the Psionic Augmentation psionic theme power that lets me choose to daze with a basic. This is a stopgap measure. I like having a power that I can use if I am not threatening the PCs enough. I can now lay waste with Double Attack and daze and do my minor for a strong damage spike… but only if I need it. (I never did). Finally, I lifted a fun weakness from the fine folk at SaveVersusDeath. He had a dracolisk that when crit was weakened and blinded. I thought that was cool, and changed it to being slowed and weakened. This did come up and was a lot of fun when it did. The mini for the Greater Basilisk was perfect! As is the art from the 3E Monster Manual! Want to see the finished version? Id Fiend Mindhorror Psionic Adept, level 5 solo controller-lurker! So, how did it play? It was fantastic. 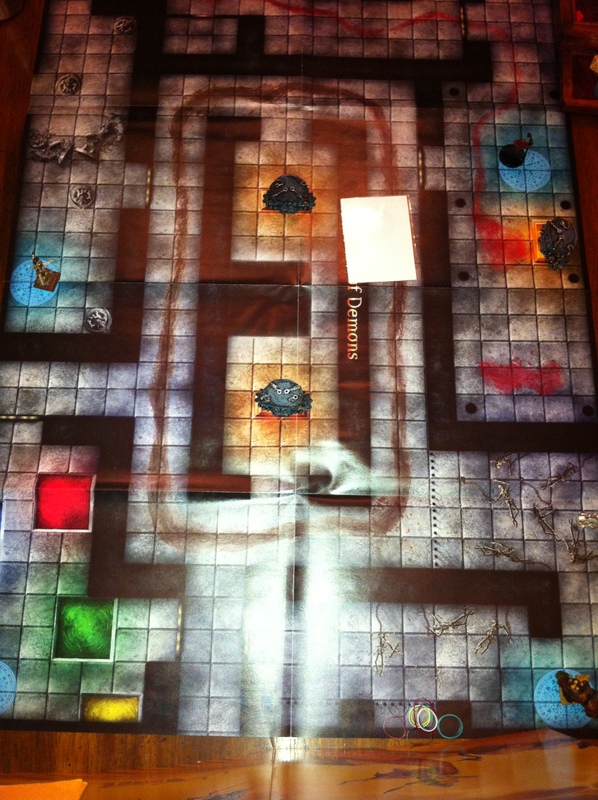 The PCs began attacked by the traps, confused, separated, and having no clear idea on where the pieces were located. 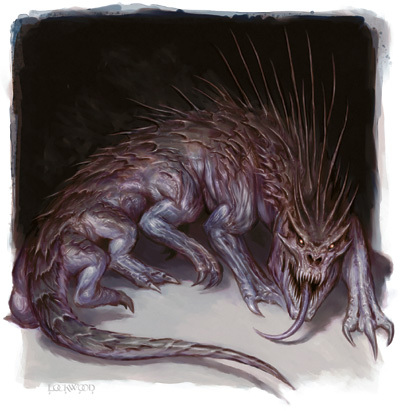 A few of the PCs had good perception checks and headed off in the right direction… all of them hearing the sounds of the loud grinding (the massive sphere) and the clawing/hissing (the Id Fiend). The psion was the lucky one to first see this massive lizard peering around the corner of a room, its body upside down and grabbing onto the low ceiling (ok, I borrowed from Aliens 3 as well!). The seeker suffered from the fear trap and went running into the hallway, narrowly missing the grinder. The half-giant warlock was escaping the whirlpool… good times. The Id Fiend performed admirably, attacking and moving away to create confusion. The PCs worked pretty well as a team to find the pieces. It was a close affair. The Id Fiend was only just bloodied and three PCs were down when the last two made it to the door and pressed the pieces of the sword into it. And then everything stopped and they were on top of mountains, looking down upon the Crescent Forest and the glittering waters of the green age! 5) To hammer home the psionic aspect they met the artifact’s keeper. He provided warnings, cryptic information on the artifact and how it could be used, and indicated the location where they could find the next piece of the artifact – an island in the deadly and vast Sea of Silt. He gifted them with the Mind’s Eye, a malachite orb that is the second part of the Crown of Sorrow. The psion greedily took it. 6) They also found two round disks. Each was engraved with pictograms, but each pointed to different locations. He then ended the visions. They once again found themselves in the ruined temple, the archway clearly bricked up and impassable. It had all taken place in their minds (though their wounds were real!). When they came out the PCs found their nemesis asking for what they had found. My players always keep me on their toes. Here I thought they would mull over what to give to the templar. Instead, they decided to run despite overwhelming odds. Ah, players. Hopefully this example of how I hack existing adventures and monsters for Dark Sun has been useful. This entry was posted on October 11, 2015 by Alphastream and tagged 4E, Ashes of Athas, Authoring, Challenge Level, Crown of Sorrow, Monsters, Terrain.